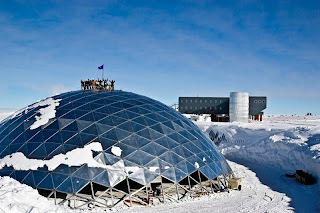 This week, I received two photos of the South Pole dome. One was the start of the deconstruction and one was what it is left today, nothing. It is amazing to see how empty the site looks. Next week, they are starting Sleigh Rides to the South Pole where some of us get to go to South Pole for an hour. It is just a chance to get a hero shot and say you've been there, but I'm not above it. Sign me up because I'd love a chance to go. I've had an amazing season already and don't expect to go, but feel free to throw some good luck my way, just in case. Also in the news these past couple weeks was Penguin Awareness Day. Penguin Awareness is January 20th. I hope you were wearing black and white, penguin colors, that day. You will be awarded extra points if you wore a tuxedo in their honor. This week, Lisa K. shared a crazy Antarctic tidbit with me. In 1961, surgeon Leonid Rogozov was the only physician stationed on an isolated 12-man Soviet base in Antarctica when he developed appendicitis. He had to remove his appendix himself. "I didn't permit myself to think about anything other than the task at hand. It was necessary to steel myself, steel myself firmly and grit my teeth. In the event that I lost consciousness, I'd given Sasha Artemev a syringe and shown him how to give me an injection. I chose a position half sitting. I explained to Zinovy Teplinsky how to hold the mirror. My poor assistants! At the last minute I looked over at them: they stood there in their surgical whites, whiter than white themselves. I was scared too. But when I picked up the needle with the novocaine and gave myself the first injection, somehow I automatically switched into operating mode, and from that point on I didn't notice anything else." I've always been amazed at the stories of Russian toughness and resourcefulness. The Russians might have lost the Cold War because they weren't able to keep up economically, but they did amazing things with what little money they did have. Does anyone know if the anecdote about NASA spending millions of dollars to get an anti-gravity pen to work while the Russians just used a pencil is true? Finally, they may have found the first airplane to be brought to Antarctica. I'm not sure of the historical importance of this because I don't think the plane was used. They left the wings at home, but mention using it as an air tractor. Whether it ever left the ground or not, it is a great look at past exploration. I'm leaving the Ice in 12 days. It has been an amazing season. time is flying quick. i remembered when you just returned to the ice, now you're leaving. i'm glad you enjoyed a great season. it sure shows. oh yeah, that doctor is incredible to perform an operation on himself!